At the centre of this painting is an illustration in a book showing how the path of projectiles launched from an earth-like body is affected by their speed and by the force of gravity. It’s the sort of illustration that one often finds in books on physics and spaceflight; the earliest version is found in Isaac Newton’s Principia Mathematica (1687). It’s the sort of illustration that has fascinated me since childhood, condensing so many concepts into a few lines – matter, space, energy, force, the bounded and the unbounded – that it’s like a little ideogram of the universe. One might also take it as embodying the Faustian aspect of western civilisation: its belief in matter, force and energy; its claims to mastery of nature; a will-to-power that recognises no limits, dreaming even of the ‘conquest of space’. My painting is really an elaboration of these ideas. I sought to create in the figure holding the book a worthy exponent of the ideas contained within it, and a deep space behind the figure that renders viscerally what is only implied by the illustration. 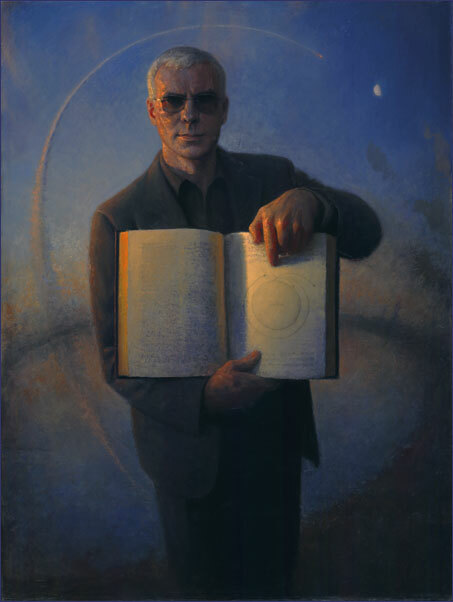 The man holding the book dominates the painting; his forceful pose and features express confidence and authority; he asserts his knowledge and power almost as a challenge to the viewer. How one responds to this challenge is for me an open question. I’ve sought to render this figure as powerfully as I can, yet I think the painting embodies my own ambivalence about him. Given the Faustian theme of this picture it’s probably inevitable that he has a demonic, Mephistophelean air about him. Compositionally, the picture is very much a contest of curves and rectangles. The ideologue and his sacred book are dominated by verticals and horizontals that resonate with the rectangular frame of the image and assert its frontal planarity, its surface. The space that curves around him and leads the eye off into the painting’s depths embody a different set of values that form an implicit critique of his dominance. It’s taken for granted that paintings are normally rectangular, part of the ensemble of rectilinear forms that permeate the manufactured human environment. Rectangles are hardly ever found in nature, however, because they tend to be rigid, immobile, brittle: anything that grows or moves is built out of curves which allow it to flex when bearing stress, to follow paths of least resistance. While I usually accept the rectangular format of painting, I find that, as I’ve striven to make my pictures ever more natural-looking, I’ve developed an aversion to horizontal and vertical lines within the image. As axes they retain huge importance, but as lines or boundaries I do my best to get rid of them; many of my paintings have no vertical or horizontal lines at all. Where they remain, they serve an emphatic purpose, both compositionally and semantically. This is certainly true in ‘The Lesson’ where verticals and horizontals mark lines of stress between man and nature. Despite the frontal forcefulness that the rectilinear forms lend the figure in this painting, I think that in the contest of forms that the image embodies, the curves are the ultimate winners. They express a flexible order, enveloping, unifying, complete. Their victory is suggested by the book illustration at the heart of this painting, which is itself built entirely from curves. Maybe that is the implicit lesson to be drawn from this image. And perhaps this fellow is aware of this: he may be a subtler, more ambiguous teacher than he at first-sight appears. He may even have a sense of humour.